Jon was classically trained at the Ritz London under then executive chef David Miller, before assisting Miller in opening his 16th-century manor house on the South Downs. Jon then spent 12 months at the renowned Eden on the Park hotel in Melbourne, then served as head chef in a number of four-star corporate hotels in the UK, including Birmingham’s Macdonald Burlington where he was executive chef for seven years. 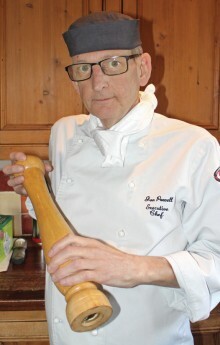 He now works freelance at various locations for sporting events, restaurants and hotels, one being the two-AA-rosette Billesley Manor in Stratford, where he met Karl Parkinson – a modern and contemporary trained chef, formerly of Michelin-star Turners restaurant in Harborne and the then three-AA-rosette French restaurant at the Belfry. Jon initially meets the client to discuss requirements and carries out a site visit, before designing a menu to meet the customer’s needs. The food on offer includes regionally-sourced meats from Warwick’s butchers in Barnt Green, plus daily fresh fish and shellfish from Brixham and Birmingham markets – anything from oysters or langoustines to exotic red snapper and sea turbot. Dishes are complemented using seasonal fruits and vegetables where possible, and all desserts are homemade, including a selection of freshly-churned ice creams, plus farmhouse cheeses and fruit chutneys. All dietary requirements can be catered for – please advise upon making your booking. Bon appetit!